Operation Frequent Wind was the final phase in the evacuation of American civilians and "at-risk" Vietnamese from Saigon, South Vietnam prior to the takeover of the city by the North Vietnamese Army (PAVN) in the Fall of Saigon. It was carried out on April 29th-30th, 1975, during the last days of the Vietnam War. More than 7,000 people were evacuated by helicopter from various points in Saigon. The airlift resulted in a number of enduring images. Evacuation plans already existed as a standard procedure for American embassies. At the beginning of March, fixed-wing aircraft began evacuating civilians from Tan Son Nhut Airport through neighboring countries. By mid-April, contingency plans were in place and preparations were underway for a possible helicopter evacuation. As the imminent collapse of Saigon became evident, Task Force 76 (TF76) was assembled off the coast near Vung Tau to support a helicopter evacuation and provide air support if required. 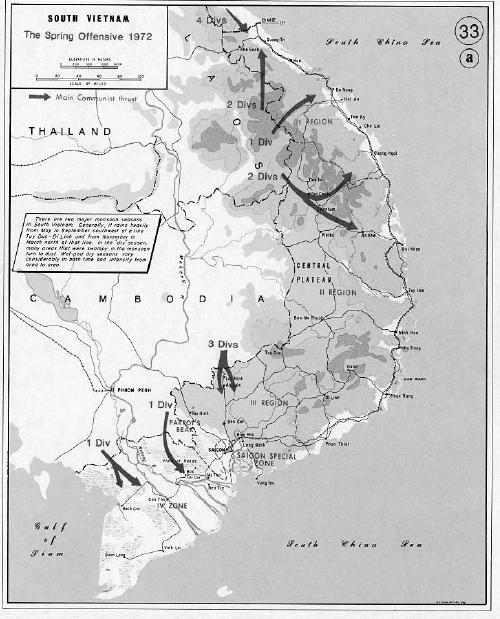 In the event, air support was not needed as the North Vietnamese paused for a week at the outskirts of Saigon, possibly waiting for the South Vietnamese government to collapse and avoiding a possible confrontation with the U.S. by allowing the mostly-unopposed evacuation of Americans from Saigon. On April 28th, Tan Son Nhut Air Base (lying adjacent to the airport) came under artillery fire and attack from Vietnamese People's Air Force aircraft. The fixed-wing evacuation was terminated and Operation Frequent Wind commenced. The evacuation took place primarily from the Defense Attache Office (DAO) compound, beginning around 14:00 on the afternoon of April 29th, and ending that night with only limited small arms damage to the helicopters. The U.S. Embassy in Saigon was intended to only be a secondary evacuation point for embassy staff, but it was soon overwhelmed with evacuees and desperate South Vietnamese. The evacuation of the embassy was completed at 07:53 on April 30th, but some 400 third country nationals were left behind. Tens of thousands of Vietnamese evacuated themselves by sea or air. With the collapse of South Vietnam, numerous boats and ships, VNAF helicopters and some fixed-wing aircraft sailed or flew out to the evacuation fleet. Helicopters began to clog ship decks and eventually, some were pushed overboard to allow others to land. Pilots of other helicopters were told to drop off their passengers and then take off and ditch in the sea, from where they would be rescued. During the fixed-wing evacuation 50,493 people (including 2,678 Vietnamese orphans) were evacuated from Tan Son Nhut. In Operation Frequent Wind a total of 1,373 Americans and 5,595 Vietnamese and third-country nationals were evacuated by helicopter. The total number of Vietnamese evacuated by Frequent Wind or self-evacuated and ending up in the custody of the United States for processing as refugees to enter the United States totaled 138,869. This operation was the debut combat deployment of the F-14 Tomcat aircraft. Our Price: $134.99 Sold Out! Our Price: $159.99 Sold Out!